Boyds Mills Press, 9781620917848, 32pp. This fascinating and whimsical nonfiction picture book uses humorous comparisons and playful artwork to teach children the unusual ways that a variety of animals--from woodpeckers to snakes to bats--use their tongues to find food, eat, and clean themselves. In this nonfiction picture book, kids will learn about the woodpecker, which uses its tongue to burrow for insects under tree bark; the okapi, which can wash its face and ears with its tongue; and the octopus, which uses its tongue to drill holes in shells. Through debut illustrator Jia Liu's bright, playful collage artwork, readers can imagine what it would be like to have a tongue like a sword, like a straw, or like a party blower, among many other silly and illuminating comparisons. The back matter expands on each animal tongue's unique abilities and includes information about other fun tongues, too. 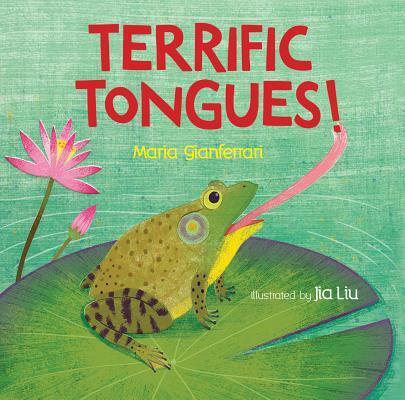 Maria Gianferrari is the author of many picture books, including Penny and Jelly, Coyote Moon, and Hello Goodbye Dog. She lives in Virginia with her husband and children. Visit mariagianferrari.com. Jia Liu received her MFA in Illustration from Maryland Institute College Arts. This is her debut picture book. She lives in Baltimore, Maryland. Visit jia-liu-t7ay.squarespace.com.